To improve history lessons on the period, educators emphasize the roles of grassroots activists, churches, schools, and women. A native of the Magnolia State, Jessica Dickens grew up just a short drive away from one of the most infamous events of Mississippi Freedom Summer: the 1964 disappearance and murder of three civil rights workers on their way to investigate a church burning. She’s also a graduate of one of Mississippi’s segregated high schools—part of a group of all-white private schools established in the 1950s to thwart school integration. Yet even with her personal ties to civil rights history, the central figures in Dickens’s history lessons in her early teaching years in Mississippi were Martin Luther King Jr. and Rosa Parks—two of the most memorable leaders from her own schooling, and staples of U.S. history textbooks. It was only with exposure to fresh thinking through a teaching fellowship on civil rights history—and after uncovering her state’s untold stories—that the 11-year veteran began to shift her teaching approach. 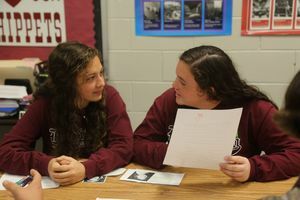 Students from Jessica Dickens’s 10th-grade class at Kosciusko Senior High School engage in a role-playing lesson about the civil rights movement. It’s a common oversight in America’s classrooms. The story of the civil rights movement, as told and retold, generally includes only well-known heroes, heroines, and watershed moments from 1954 to 1968: Brown v. Board of Education, Martin Luther King Jr., Rosa Parks, the Montgomery bus boycott, sit-ins, and nonviolent black protests. In assessing states’ curriculum standards, a 2014 report from the Southern Poverty Law Center concluded that coverage of the movement was “woefully inadequate” and focused on “a small group of charismatic leaders” and “a series of dates, names, and actions.” Five states—Alaska, Iowa, Maine, Oregon, and Wyoming—neither covered the movement in their standards nor provided supplemental materials to teach it. But a new push is underway among educators like Dickens to correct this narrow view. Prompted by a curiosity about the period’s subtleties and complexities, teachers across the country are modifying their curricula and abandoning their textbooks to teach a more accurate history that commonly goes untold: the role of grassroots activists and women, nuanced portraits of leaders like Parks and King, and racial and social justice battles that link the past to contemporary issues of inequality. 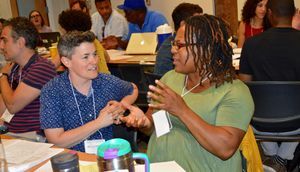 Motivated by a desire to deepen his historical knowledge, Broudo recently joined more than two dozen middle and high school teachers at Duke University for a three-week summer institute led by veterans of the civil rights movement and recognized experts on the black freedom struggle. Textbooks were spurned in favor of primary documents—including original curriculum from the 1964 Mississippi Freedom Schools, numerous in-depth readings on little-known activists of the era such as Amzie Moore, and recorded interviews and archival video footage from civil rights organizers like Ella Baker. Throughout the seminar, a bottom-up teaching of history was emphasized, aimed at debunking many of the common misperceptions and misunderstandings about the period. Teachers at the summer institute explore primary documents at Duke University’s David M. Rubenstein Rare Book and Manuscript Library. Even though participants had sought out the experience, many were still surprised by what they learned—specifically the roles of black churches, youth, schools, families, and grassroots organizations in furthering the movement. In particular, many were unaware of the significance and leadership of black women, which Judy Richardson, codirector of the institute, said is among the most underreported angles in history lessons. In the mass action against Montgomery’s bus system, “women put the leaflets out, they’re the ones who tell the black community that Mrs. Parks has been arrested and suggest a boycott of the buses,” and yet “the traditional narrative is only men,” said Richardson, a veteran of the Student Nonviolent Coordinating Committee (SNCC), a prominent group formed in the 1960s, and coeditor of Hands on the Freedom Plow: Personal Accounts by Women in SNCC. The institute’s reteaching of movement history mirrored what many notable researchers have been saying for decades. In a 2006 paper, historian Derrick P. Alridge scrutinized six widely used high school history textbooks to analyze the depiction of Martin Luther King Jr., finding King was universally portrayed as “moderate, magnetic, and inspirational... rather than the radical and controversial figure he was during his lifetime.” Likewise, the image of Rosa Parks as meek and mild is a grossly oversimplified interpretation, writes Jeanne Theoharis, a political science professor at Brooklyn College. Parks was a seasoned organizer and activist in Montgomery, Alabama, for over a decade before the yearlong bus boycott. This top-down framing in most history curricula—which puts the focus on renowned leaders—obscures the story of the significant local organizing that fueled civil rights victories, said Tina Tosto, an English teacher at Pascagoula High School in Mississippi and former middle school history teacher. Tosto, who attended the institute, added that isolating the period in history lessons also deprives students of an understanding of the key historical events leading up to the movement—namely the role of black World War II veterans who demanded equality at home after serving overseas—and the chronic societal problems it failed to fully resolve. Yet learning new content is one thing—it’s another to discuss a historical era rooted in brutality and racism. At the institute, thorny issues surfaced following the screening of Eyes on the Prize, the award-winning series on the civil rights movement. The stark contrast between academic discussions on racial oppression and the raw realities exposed in the documentary footage sparked tough conversations between the black teachers and their white counterparts, who formed the bulk of institute attendees, just as white teachers make up the vast majority of the nation’s public school teaching force. Two teachers discuss lessons at the summer institute. 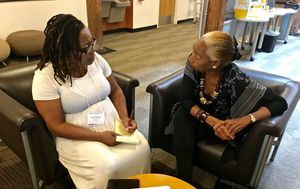 Crystal Proctor, a black social studies teacher at Suitland High School in Forestville, Maryland, said the participants were resisting “what we’ve always been taught versus the truth,” and compared the exchanges to what she’s observed in tense, emotional classroom discussions on race. 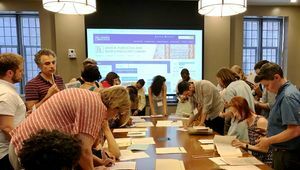 Teachers also questioned how easy or difficult it would be to apply what they learned at Duke within their schools, which are not necessarily full of peers ready and willing to change their teaching practice, according to a number of participants. “I had a coworker who said that teaching so in-depth about wrongdoings against African Americans was divisive... and that we all need to ‘get over it,’” said Tosto, referencing teachers’ resistance to embracing a more accurate retelling of the movement. Other teachers pointed to challenges at a higher level, such as a lack of support for professional development from administrators and an overemphasis on state accountability mandates. These sentiments echo what civil rights scholar Charles M. Payne, a professor at Rutgers University-Newark, explained as a general lack of institutional support for teaching about the movement, and racial conflict more broadly, in American schools. The result, he said, is a “mangling of history” in which the movement is taught as a moral plea rather than a battle for political and economic power. A teacher gets feedback from Jennifer Lawson, an SNCC veteran, at the summer institute. As with other tumultuous periods in American history, such as the forced migration of Native Americans or the internment of Japanese Americans, Payne said, civil rights education is “cursory and sanitized,” often neglecting to emphasize how controversial and disruptive the period actually was. Payne stressed the value in school leadership taking the lead in changing that framing. The payoff for students when the civil rights movement is comprehensively taught is considerable, added Payne, noting that young people come away able to interpret social change from a more critical perspective and see themselves as part of it. The impact may even be more sizable for white students, “who are even further removed from the history” than black youth, who may be similarly unaware of the events outside of the standard narrative but do have a “sense of the structural features of inequality” from their daily lives, he said. To broaden her students’ understanding of the civil rights movement, Jann’l Henry, a middle school English teacher at Whittier Education Campus, a K–8 public school in Washington, DC, introduced her class to the biography of Claudette Colvin, a contemporary of Rosa Parks, and a documentary on Bayard Rustin, the organizer of the 1963 March on Washington. Students in Jessica Dickens’s class take on the identities of civil rights activists during the "Stepping Into Selma" activity. Similarly, through a role-playing activity on the civil rights movement, Dickens awakened the curiosity of her 10th-grade students in rural Mississippi. 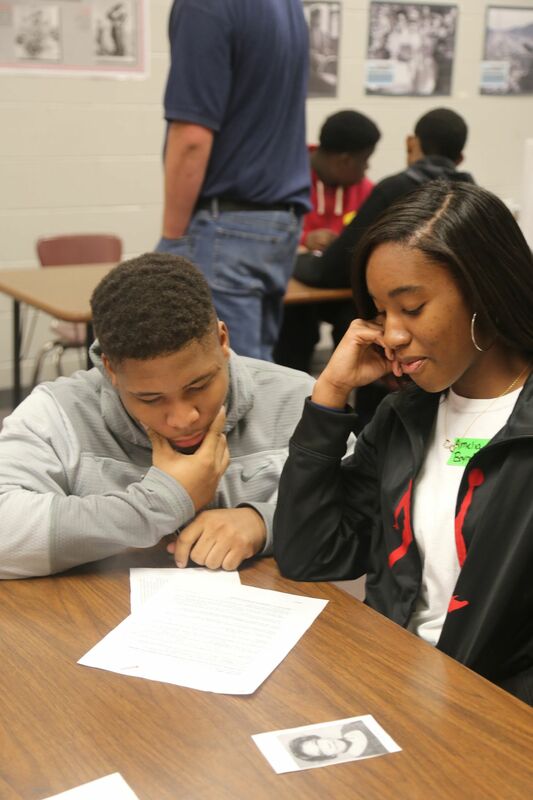 “Stepping into Selma”—a city that played a major role in the freedom struggle—allowed her class to take on the identities of activists from the period, many of whom were the students’ own age at the time, which increased the relevance and impact of the lesson, she said. Yet the most enduring outcome of reconsidering the civil rights era, according to Henry, may be helping all students critically examine the influence of social and political movements and connect the past to the present day.